An upside down parabola on a chart referring to a theoretical optimal tax rate that will maximize government revenues. The theory behind the Laffer curve states that there is a certain point, known as T*, at which a government collects the greatest possible amount in taxes. If taxes are lower than T*, the government collects less because taxpayers are not required to pay. If it is higher than T*, people have an incentive to work less because more of their money goes to the government and, as a result, the government collects less. Economists disagree about whether the Laffer curve is true, but even supporters agree that T* is only an approximation. a curve depicting the possible relationship between INCOME TAX rates and total TAX revenue received by the government. Fig. 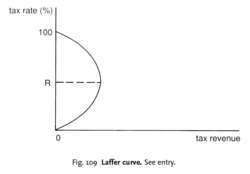 109 shows a typical Laffer curve. As tax rates per pound of income are raised by the government, total tax revenue, or yield, initially increases. If tax rate is increased beyond OR, however, then this higher tax rate has a disincentive effect so that fewer people will offer themselves for employment (see POVERTY TRAP) and existing workers will not be inclined to work overtime. The result is that the tax base declines and government tax receipts fall at higher tax rates. The possible Laffer curve relationship has been used by governments in recent years as a justification for cuts in tax rate as part of a programme of work incentives (see SUPPLY-SIDE ECONOMICS). Observing a group's taxable income before and after a tax change will not yield the true taxable income elasticity unless there are no other changes (in the business cycle, for example) that influence income at the same time. The largest regression estimates of the taxable income elasticity from all of the previous historical periods are lower than the smallest estimates in the literature based on the 1980s. They brought the concept of taxable income elasticity to the fore and showed how it could be measured empirically. Instead, the overall taxable income elasticity estimates derived from cross-sectional data were closer to some of the values reported by Auten and Carroll, who, like Feldstein, also compared tax returns of the same individuals before and after the 1986 tax reform. Auten and Joulfaian, "The Taxable Income Elasticity of High-Income Taxpayers: Evidence From a Long Panel," Social Science Research Network-Working Paper Series 1406641 (2009).